The Whales have been absorbed in the reading of Charlotte's Web, a classic tale of farm life by E.B. White. 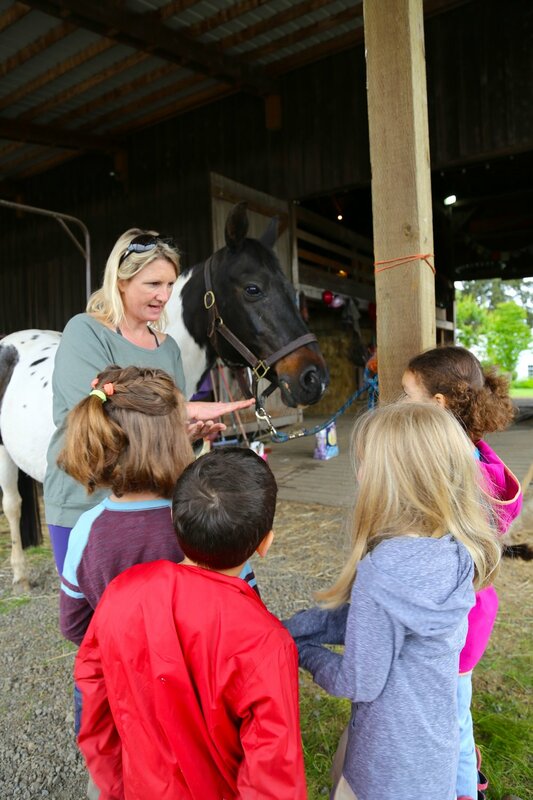 To commemorate our reading, and to celebrate the coming of summer, the Whales took a trip to a charming farm owned by one of our very own Whale families. We rotated through stations that included horses, sheep & chickens, bees & pollinators and macroinvertebrates & ducks. We ate lunch in the garden and capped our day off by making beautiful tussie-mussie bouquets. It was a truly magical day, filled with exploration and good friends! The last two weeks, Whales spent time learning about rain, the water cycle, water conservation, thunder & lightning, and how our sun makes the seasons...PHEW! To cement our understanding of rain and the water cycle, Whales performed a play together on our big blue carpet. We moved all the chairs into a circle and Whales became drops of water floating on the surface of the ocean. As the heat from the sun made them rise as vapor in the air, Whales rose so high that they stood up on their chairs together, condensing into a giant cloud before falling back to earth as raindrops. What fun! Ms. Ellie performed an experiment which showed the three states of water and Whales spent time looking more deeply at the concept through the proscope during classroom choice. Whales celebrated our study of rain with an Umbrella Walk. We enjoyed closing our eyes and listening to the sound of the rain on our umbrellas. Our study of rain included time reading and acting out a sampling of Rain Poems. In atelier we spent time making Rain Art and continued our study of wind by making pinwheels. No study of weather would be complete without taking a closer look at thunder and lightning. After reading a few books on the subject, Whales tried making their own lightning by creating static electricity with a balloon and their hair. It worked! Whales made enough static electricity to light up a light bulb. To replicate the hot air created inside a cloud during a lightning storm, Whales blew up paper bags and popped them with their fists. BOOM! That same day, Whales read the book Thundercake by Patricia Palacco, then they baked their very own Thundercake with Ms. Julie. It was a celebratory ending to a very exciting day! With Earth Day coming up, Whales talked a lot about how important it is for us to conserve water. Whales came up with some ideas for how to conserve water at home and at school, then we tried to see if we could clean some very dirty pond water that Ms. Ellie brought from home. We read a book about how cities work to purify their own water and we followed those same steps with the pond water. It worked! We began to see how hard it was to get dirty water clean again! Whales know that the sun is critical to all our weather systems, and to life on earth. During our final week of our weather unit, Whales became the sun and the earth. We went out into the piazza and practiced rotating, making day and night, and we practiced orbiting the sun to make one year. We spent time looking at a globe in our dark bathroom. We noticed that the earth was tilted on the globe, and that as the earth orbits the sun, different amounts of light and heat fall on our area of the earth, making the seasons. Amazing! Finally, don't forget to check out the now-famous Whale Weather Reports on the Watch and Listen tab above. Broadcasts happen daily in the entrance to the ELC. Whales are meteorologists! Just in time for the Spring Break, Whale families came together to learn new dice and card games that help develop skills in numeracy and executive function. Each Whale family brought home a bag filled with all the items needed to play the new games at home. It was a night of friendship, family and FUN! All week the Whale classroom was filled with talk of wee leprechauns and their rascally ways! We spent Friday morning engineering traps and writing letters to the leprechauns that included concrete directions for how to successfully gain entrance to the trap. After lunch, the Whales entered the classroom to find it in a real state of disarray. The leprechauns had paid a visit! Chairs were tipped over, our writing station was torn apart and there was glitter everywhere(including the toilets!). Although no leprechauns stayed trapped long enough for us to talk with them, they did leave a lollipop and chocolate mint for each student. Happy St. Patrick's Day, Whales! It was a wonderfully wacky Friday, full of rhyming books, painted feet, gooey gak, crazy obstacle courses, green eggs and ham, puppet shows and all the exuberance and magic of Dr. Seuss. Happy Seuss Day Whales! The Whales completed an extensive study of migration last month. After choosing their favorite migrating animal, Whales executed a detailed painting of it, paying attention to color, shape and size. Students did some extra research at home, looking at the migratory path their animal takes, and noting any special characteristics they could share with their friends. Whales measured their animal's path of migration and logged the length on our distance board. Whale students have spent the last few weeks listening (and trying to replicate!) the sounds of their migrating animals as they shared the information they learned about their animal with their friends. We compared and contrasted migration distances of each animal, paying attention to concepts of shorter and longer as they related to our migration map. To finish up our unit on migration, Whales took part in a Migratory Bird Obstacle Course. Whales started by making a list of all the things they learned made an impact on animal migration. Whales discovered that many of the problems they listed were caused by humans! As they teamed up to "fly south" in our Creative Play area, the ELC was filled with the sound of chirping, screeching, trilling migratory birds. Every species of bird made the long trip, but they all remarked how hard it was to make the journey with all those extra, dangerous obstacles in their path!